A conservative politician had better be pro-business. In terms of garnering campaign donations—the fuel that drives candidates to election-time victories—being pro-business is being pro-money. It also helps when a business that a Utah politician supports is headquartered in Utah and brings in revenue from outside of the state. Since then, multilevel-marketing companies have become ever more at home in Utah. Their headquarters and campuses have grown; they’ve bought naming rights at sporting arenas, concert venues and a high-rise office in Utah County. Like the ski industry, they are an industry closely associated with Utah, thanks to the help of politicians on all levels of government. The industry blossomed in Utah in the mid-2000s, selling consumers around the country on get-rich-quick, do-it-yourself business plans. These companies acquire sales leads, often the names of people who click on Facebook ads that say “work from home” or those who purchase “business success kits” from infomercials. Then they call those consumers and upsell them on costly coaching services to help launch their own Internet businesses or profit from online auctions or real-estate-investment schemes. Several Utah call centers have acquired a bad reputation for fraudulently overstating opportunities, making illegal promises to customers about the money they’ll rake in, refusing to give refunds and placing unapproved charges on customers’ credit cards. State and federal regulators have been slow to catch onto the abuses of the OBO industry. “Fraud built Utah like cocaine built Miami,” says Jason Jones, a critic of OBO companies. A former Utahn now residing in Chicago, Jones has been following the industry’s ups and downs on his blog, The Salty Droid, since 2009. He says it’s hardly a secret that Utah is a “no-enforcement zone” when it comes to prosecuting culprits in the industry. That’s because OBO companies have done their homework. They worked hard to win over pro-business politicians. In 2008, the call-center industry collectively donated in the neighborhood of $200,000 to Shurtleff, even while a number of those contributors faced legal actions from the Attorney General’s Office, as well as administrative actions from the Utah Division of Consumer Protection. During Shurtleff’s brief run for Senate in 2009, his campaign banked another $92,000 from companies in the dialing, coaching and upselling industry, according to a review of his state and federal campaign-finance-disclosure documents. Two high-profile Shurtleff contributors—Mentoring of America and IWorks—subsequently were charged by the Federal Trade Commission. The agency won its case against Mentoring of America (and affiliated companies) and is now seeking $450 million in damages allegedly taken from more than a million consumers. IWorks’ owner Jeremy Johnson has been charged for defrauding consumers out of $275 million. But change is in the air. After a dozen years in office, Shurtleff will be stepping down in 2013. 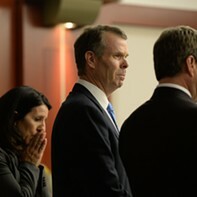 He is making it his mission to see that the person who will fill his shoes is Republican John Swallow, his chief deputy. Swallow has campaigned to press on in the legal fight for state control of federal lands and to put a stop to President Obama’s 2010 health-care reform. But as Swallow recently told a call-center owner in a private phone conversation, he also wants to place the state Division of Consumer Protection under control of the Attorney General’s Office. This would enable the Attorney General’s Office to oversee both the investigation and the prosecution of businesses who are named in consumer complaints. As Shurtleff’s heir apparent, Swallow is a magnet for OBO campaign contributions, thus far banking $82,284 from companies known to be involved in the OBO industry, according to campaign finance disclosures. But currying favor with pro-business politicians doesn’t begin and end with campaign cash. OBO companies also court government through in-kind services, charitable deeds and mutual endorsements. And their efforts, at least in Utah, have not been in vain. Indeed, while the Federal Trade Commission has charged multiple Utah telemarketing companies with serious fraud charges, according to Utah’s Administrative Office of the Courts, on the state level there is no record of a felony or misdemeanor conviction against a company or an individual for violating Utah’s Telephone Fraud Prevention Act since the law regulating telemarketers was enacted in 1993. The industry itself was emerging and taking form, crafting products for consumers looking for extra money or help setting up a home business. Consumers watching late-night TV would learn about entrepreneurs who’d written a book or developed a system enabling consumers to “work from home part time.” Whether consumers wanted to make extra money from government grants, Internet auctions or real-estate transactions, they’d usually hear buzz phrases like: “Set your own hours” and “Be your own boss.” The entrepreneur on TV may have made money off his or her own system, but the “coaches” who buy the leads from the TV show make their money off consumers. And they make lots of money. Some companies charge consumers, depending on their available credit, between $5,000 to $20,000 for special coaching services. If the coaching services leave consumers wanting, many consumers will say nothing because shame and embarrassment keep them from asking for their money back. Those who do complain to the state of Utah may not realize that unlike some states, Utah’s Division of Consumer Protection is separate from the Attorney General’s Office. The investigators in Consumer Protection depend on the Attorney General’s Office to prosecute the cases. Some of the first OBO companies to put Attorney General Mark Shurtleff on speed dial were IWorks and Mentoring of America. Jeremy Johnson, the millionaire philanthropist who owned IWorks, took Shurtleff on at least one trip on his private jet and offered to transport officials on state business in his private helicopter. Johnson was charged in 2010 by the Federal Trade Commission for defrauding thousands of American consumers out of $275 million. Another company among Shurtleff’s OBO contributors, Mentoring of America, which City Weekly reported on in “Called Into Question,” faced numerous sanctions from state consumer-protection investigators and at one point avoided paying more than $100,000 in potential fines. Through a 2007 settlement, Mentoring of America paid no fines and promised to reform its practices and join an industry association—which has since disbanded. In 2009, Mentoring of America was charged by the FTC for running an elaborate telemarketing and upselling scheme. On May 1, 2012, the FTC won its case against Mentoring of America and affiliated companies, and the agency is now seeking $450 million in damages the government says the companies took from more than a million consumers. The judge is still deliberating on the final amount of damages to award.